Much of the food at Maui’s best restaurants is sourced locally, so get ready for fresh from the sea and farm fare. This list caters to families. All of these hot spots have good vibes and good grub. So pack up the kids and head to paradise, where the only thing that rivals the fabulous food are the ocean views. The hottest treat on Maui is actually super cool. 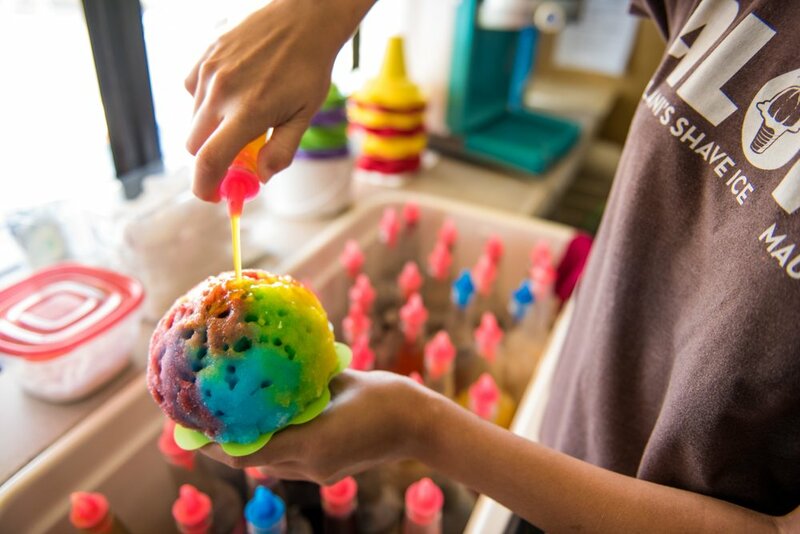 Ululani’s Hawaiian Shave Ice has been called the best shave ice in the world. There’s six locations on Maui where employees make their own ice from pure filtered water and shave it as finely as possible for the smoothest texture. There are nearly 50 flavors to choose from, and all the syrups are housemade; many of them are made from real fruit! KidTripster got the inside scoop: the two most popular flavors at Ululani’s are coconut and mango. The most popular toppings and add-ons? A scoop of gourmet ice cream at the bottom with snow cap (condensed milk/cream), mochi, and toasted coconut on top. It’s true what they say, “not all shave ice is created equal.” Now if only they could do something about the resulting brain freeze. Sink your toes in the sand, grab a hold of your customized spork, and be ready when the humongous hula pie arrives. It’ll be devoured faster than you can say, “aloha!” Kimo’s original hula pie (chocolate cookie crust, macadamia nut ice cream, hot fudge, toasted macadamia nuts, and whipped cream) at popular Hula Grill on Ka’anapali Beach is famous. All the food here is delicious, the servers are friendly, and the atmosphere is “Maui casual” with beautiful ocean views and live Hawaiian music. I highly recommend Hula Grill’s BBQ pork sandwich served on a purple poi bun. KidTripster Tip: The Barefoot Bar is definitely kid-friendly and less expensive than Hula Grill’s adjacent dining room, which offers a more fine dining experience. Look for the side of fresh pineapple on the kids’ menu. If your kids love Italian food, head to casual, open-air Manoli’s Pizza Company in Wailea! The kids’ menu is all-you-can-eat cheese pizza or spaghetti, including a drink and dessert, for just 99¢ plus your child’s age (up to 10). Parents will love the organic wheat crust pizza and variety of toppings. 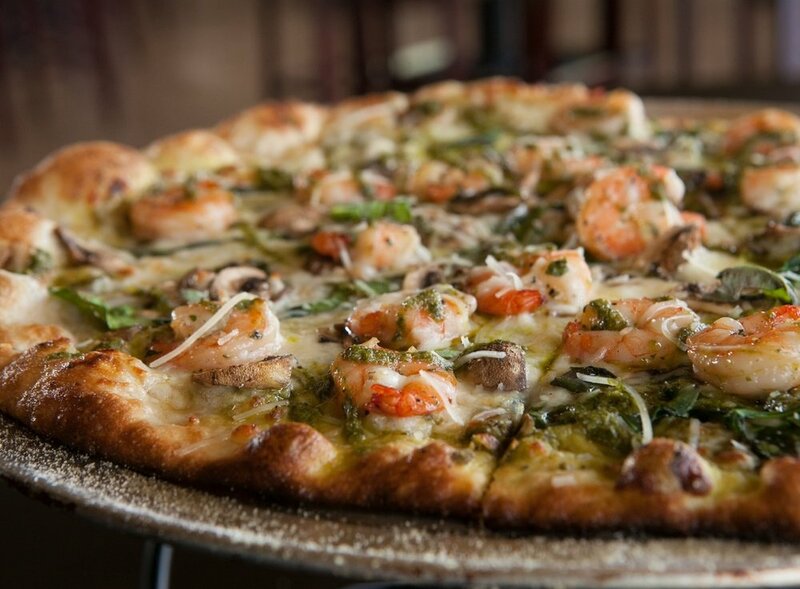 I recommend the shrimp pesto with spinach and mushroom. Sports fans will appreciate lots of TVs to keep an eye on the game. And the friendly staff at Manoli’s makes you feel right at home. Also, the sunset views over the golf course are well above par. Home to the “Best Chef on Maui,” Alex Stanislaw, the oceanfront Sea House Restaurant at Napili Kai Beach Resort has been named the “Most Maui-est” restaurant on the island. The Sea House serves excellent sea-to-table cuisine, overlooking one of the most beautiful bays on the island. Anytime Opakapaka (Hawaiian pink snapper) is on the menu, snap it up! My family also loves the coconut shrimp, crispy crab avocado sushi, and the chicken papaya salad. And because you’re on “island time,” order a Blue Hawaii cocktail at lunch or dinner. Did we mention the stunning, oceanside view? KidTripster Tip: If you’re staying as guests at Napili Kai Beach Resort, kids (ages 12 and under) eat free. Otherwise, all kids’ meals are reasonably priced at $7. This award-winning microbrewery operates two family-friendly restaurants on Maui - one in the Kahana Gateway Shopping Center and the newest restaurant at brewery headquarters in Kihei. Maui Brewing Company serves up fresh, handcrafted ales and lagers (36 brews on tap), cocktails, and delicious island-inspired meals at lunch and dinner. The menu features small plates, craft pizzas, gourmet burgers, loco moco, mahi tacos, and Hawaiian comfort food like the delicious pub plate with kalua pork, ulu macaroni salad, and white rice. I also recommend the seared ahi cobb salad with housemade, wasabi-cilantro vinaigrette. There’s a keiki (kids’) menu: fish and chips, pizza, cheesy mac, and organic pasta. Finish off the meal with a skillet cookie for dessert! The sushi at Miso Phat is straight off its own fishing boat - it’s that fresh! Owner Shawn Steadman catches the fish and even grows much of the produce for his restaurants. His popular sushi bars in Lahaina and Kihei are a favorite with our KidTripster cub reporters. 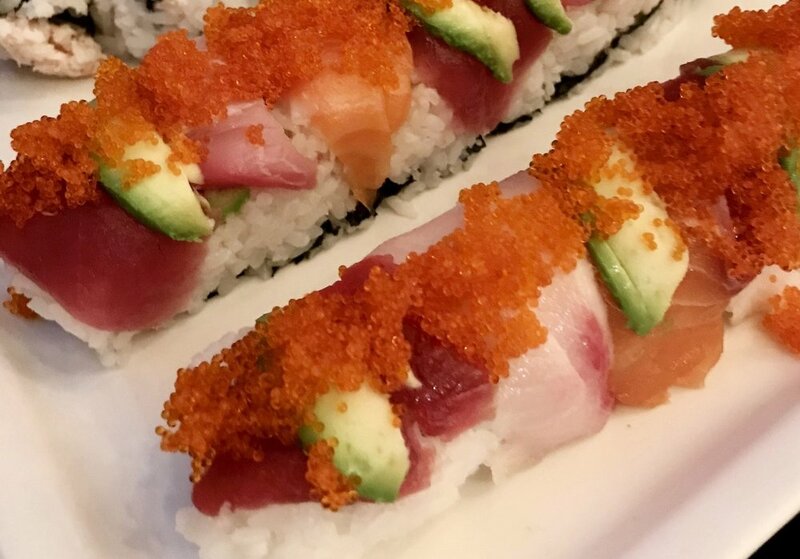 The generously-portioned rainbow roll is almost too pretty to eat! The menu is full of classic sashimi and nigiri plus modern specialty rolls. The kids’ menu has shrimp tempura and rice or baked teriyaki salmon for $8. And make sure to order the homemade lilikoi (Hawaiian passion fruit) ice cream for dessert. Dine in at Miso Phat or get your sushi to-go. KidTripster Tip: Miso Phat Sushi is BYOB. All the cool kids are Monkeypodders. Monkeypod Kitchen, owned by renowned chef Peter Merriman, is quickly becoming a favorite with three eateries on Maui. This fun restaurant serving fresh fish, organic seasonal produce, housemade bread, plus an impressive wine, beer and cocktail list hits all the right notes; there’s even live music. The menu features pumpkin patch ravioli, truffle fries, lobster pizza, tacos, burgers, and noodles. There’s a keiki menu with the regular offerings, but here’s something you don’t see often - noodles and cheese is free for kids under 3. Wendy Thies Sell is a former television news anchor, freelance writer, emcee, and mom of two based on California’s Central Coast, conveniently close to wine country and the beach.